Presentations focusing on marketing tips are relative. Great marketing strategies aren't very useful if an organization doesn't have the resources available to implement them. I haven't encountered an organization yet that has an unlimited marketing budget. It's been my experience that very few marketing directors feel they have enough resources and some organizations get by without a marketing director. Certainly every naval ship museum faces different marketing challenges and opportunities, each armed with resources unique to that museum. So rather than present "what you can do to market your museum" without regard to resource realities, this presentation will outline the fundamental philosophies and approaches used aboard the USS Midway Museum in planning and executing its marketing plan. The emphasis will be on core strategies with an eye toward a limited budget. They are based on six years' experience, from the day Midway opened in June 2004. Today, our attendance is approaching 900,000. In addition to daily museum operations, annually we host approximately 200 private events, 100 active-duty military events, 40,000 students in our K-12 education program, and about 5,000 youngsters in our sleepover program. That makes for a wide variety of target audiences for a museum that is only six years old, one that is adding new features and exhibits every year, and has a 10-year master build-out plan in place. Ours is a fluid and multi-dimensional marketing environment. However, in many ways it is quite similar to the fundamental marketing situation faced by nearly all naval aviation museums. We certainly know the story we want to tell aboard the USS Midway Museum. As a naval aviation museum aboard a historic aircraft carrier in the birthplace of naval aviation, our course is clearly laid out. However, our visitors tell us how to tell the story, both in terms of exhibit development and marketing communications. We listen to them principally through a no-cost exit survey program. We have developed a two page, fill-in-the-blank survey that tells us great deal about our visitors and their experience aboard Midway (Appendix A). Employees ask about 60 guests a week to fill out the survey, and they receive a complimentary Midway bookmark or postcard for their trouble. We find people are happy to give us their opinion. Our annual sample size is 3,000 surveys, but any sample size is worth the effort. If it were 20 surveys a week generating annual 1,000 points of feedback, it still would be useful. But it is useful only if we have a way to easily read the results. We do this by having a volunteer enter the survey answers into a very affordable online survey service, called Survey Monkey (www.surveymonkey.com). Although designed for online surveys, you can manually enter the survey answers you've collected and then summarize and print out a wide variety of analytical data. The figure below, for example, tracks what our guests enjoy most. Nearly 99% rate the flight deck and aircraft as good/excellent. Our gift shop, however, rates a much lower overall grade. Interestingly, the relative statistics are constant, regardless of whether we are in the "tourist season" or not. An example of how this can benefit: Our surveys tell us that about 11% of our visitors are Hispanic. But we know from the Convention & Visitors Bureau that 38% of San Diego's 24 million visitors are Hispanic. And we know Hispanics comprise about the same percentage of San Diego's local population. So today we are grappling with how we can do a better job of reaching and relating to the Hispanic community. We believe tapping other sources of information is our most cost-effective approach to understanding our guests. That, coupled with an easy, museum-specific survey program gives us far more confidence in developing our marketing plans. A cornerstone of affordable marketing is media relations (they used to call it "publicity" or "free advertising.") There are several aspects we keep in mind, given the revolution that is taking place in the news media. A front page story in your local newspaper likely will be seen by only 33% of local residents! That's because daily newspaper circulation is plummeting. A lead story on the 6 p.m. television news? Typically only about 20% of local residents might be watching. The lesson is that media relations is a marathon. No single story will generate widespread and lasting awareness, much less an influx of sustained visits. We'll take 5 smaller items in the newspaper during the course of a month over a front page story anytime. How can you generate publicity with little or no internal expertise? We have found local PR firms often embrace fixed, short-term pro-bono projects for museums like Midway. In our case a PR firm agreed to develop a local media contact list (names, areas of assignment, phone number and email address) for us. Our list included reporters, photographers, videographers, fledgling online news sites, etc. That saved us tons of time, and the PR firm had a clearly defined, pro bono engagement that didn't get out of control. The milestone comes only three weeks short of Midway's sixth anniversary (June 7, 2004). In that time, Midway has grown to hosting nearly 40,000 school students annually, 5,000 youngsters a year on sleepovers, and have hosted more than 1,500 private events since opening. The lucky guest today (Thursday) will receive a number of Midway-related gifts and a private docent tour of what has become the most-visited floating ship museum in the country. Thanks for your consideration. So we think about what's going on aboard Midway of interest to business? To a photo editor? For seniors? Then a quick email to the appropriate person, based on the list the PR firm (or volunteer) developed. It can be virtually no-cost publicity, if you stay organized and approach it from the news media's perspective. Finally, we "make" as much news as possible. The ex-journalist in me is always thinking about how we can tap into existing activities in the community. Think about upcoming anniversaries in our ship's history and suggest a retrospective story. Enter award contests and then publicize any awards we receive. Localize national stories: When the national media was reporting an aircraft carrier accident, we made a Midway docent/former Midway officer available to comment on carrier danger and the premium placed on training. A kindred spirit to traditional media relations is social media. I became a convert when we started a Facebook page without any publicity and within 30 days more than 1,500 "fans" had signed up for updates. With very limited staff, we found a volunteer who "gets" social media and who created and now maintains our Facebook page. This is one of the few areas of marketing that I personally know little about, but I accept its importance, and have turned it over to a volunteer who is fully immersed it in. It's worked out beautifully. I've learned I can't be an expert in everything, so it's best to stay focused on what I do best. Then I create opportunities for others to contribute their passion and expertise to the overall marketing communications effort for the USS Midway Museum. Success almost always is a team effort. 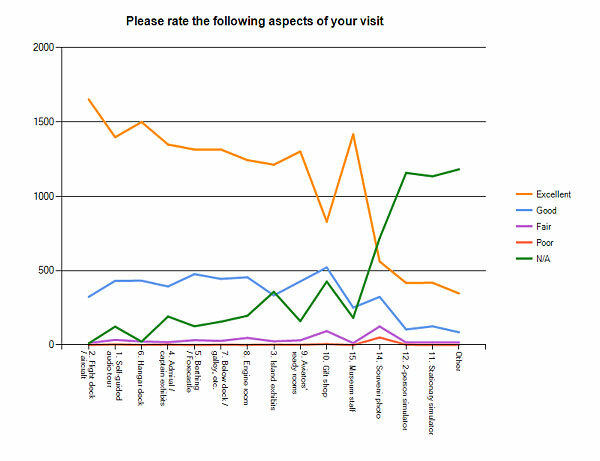 Just as we listen to those who visit the museum, we want to know what our website visitors think. To us, the website is the front door the USS Midway Museum. So we use a free service, Google Analytics (www.google.com/analytics), which provides free reports on visitors to our website, most-visited pages, length of stay, search engine preference, etc. It's an amazing amount of no-cost data that we review every 60 days. For example, Appendix B shows one aspect of website traffic for July 2010. It tells us that the most-visited pages clearly are by people interested in visiting the museum. That directs us to spend the most time in updating those portions of the website with new material. Today, we are moving into posting short videos (produced by a volunteer) about the museum on YouTube and linking them back to our website. It costs us nothing. In fact, our philosophy is to convert as much (costly) printed material into website info as possible. Our media kit for reporters is not printed. We send the reporters a website link. When people ask for photos, we send them to downloadable pictures on the website. We also provide drawings of the space available for private events aboard the USS Midway Museum on the website. This can be done at virtually no cost to the museum, and we routinely find people appreciate the instant access of a website. No one has a big enough advertising budget! One effective approach we've found is to advertise in association and organization newsletters. They often welcome the revenue and it's an easy way to maintain awareness among Chamber of Commerce members, for example. When it comes to radio/television advertising, I don't have the budget to produce catchy, :30- and :60-second commercials. So I spend my limited budget on sponsoring radio/TV traffic reports. It's quick awareness building with enough time to promote an upcoming event or program, and referring the audience to our website for more information. You can provide a lot of information in only a :10- or :15-second tag. We're also big believers in on-air radio station promotions. I'm more than happy to donate many "family four-packs" of tickets to Midway as part of an on-air promotion by a popular local radio personality. Tickets don't really cost us much, the station gets something valuable to offer its audience, and we generate the exposure we otherwise couldn't afford. We spend as much time "ashore" as possible. Even a handful of volunteers can be a big help by staffing a table at a Chamber mixer, art fair, farmer's market, etc. We also donate tickets as fundraising tools to organizations ranging from PTA chapters to the Blood Bank. We limit it to nonprofit organizations in San Diego County, but even at that we donate to more than 300 worthy organizations a year. Again, it's promotional exposure for Midway at a "cost" of some tickets that may or may not be used! More recently, we have been offering to host various civic and business organization meetings aboard Midway. While that may not be feasible for everyone, we think enabling the Chamber of Commerce's board of directors to hold an early-morning meeting at a "fun location" is a no-cost way of generating exposure and word-of-mouth advertising. When they hold a meeting aboard, each participant receives a free ticket to return and explore the museum. They almost always return with paying guests and even if they don't visit, they have something nice to say about the museum. We place a high priority on local referrals, knowing that 50% of San Diego's 24 million annual visitors stay in private residences. When the PGA Tour comes to San Diego, we offer free tickets to attendees of its Military Appreciation Luncheon. We have two college bowl games in the area, and work closely with bowl officials so we can promote to the participating teams and booster clubs. Midway has a humanitarian mission heritage so we often team with the Red Cross and Blood Bank when they have donation drives. Similarly, we host a celebration for the Girl Scouts' Operation Thin Mints campaign each year, an event that draws more than 1,000 people and the news media. The San Diego Padres have a very strong military appreciation orientation so we work closely with their VP of Military Affairs on various promotions throughout the season. Again, this rarely costs us anything beyond some free or discounted admissions. We have found the key is to plan ahead--as much as a year--to get the most value from a partnership. (Last week we contacted the County about having one of its summer "Movie Nights in the Park" in 2011 on our flight deck. The Parks & Recreation Director jumped at the opportunity, suggested more than one date, and offered to help find sponsors. What a great way to promote Midway to hundreds of San Diego families, simply by making ourselves available to an existing program! A senior-level San Diego State University marketing class took our museum on as a project. Over the course of a semester the students developed a marketing plan for us. Admittedly, about 80% already had been considered, 10% was off the mark, but the remaining 10% was brilliant and inspirational. We came away with several new ideas from the experience. We contacted the owner of most of the outdoor billboards, bus shelters, and shopping mall poster stands in San Diego. He agreed to donate the space on billboards that went unsold if we paid for production of the outdoor advertising. Over the past several years we have received more than $100,000 worth of no-cost advertising exposure on major freeways, in return for honoring the billboard owner as a major museum contributor. We have a very professional brochure that promotes our private event capability. We produced it at no cost to the museum by working with Hawthorn Brochure. They sell ads to museum partners and event vendors. That pays for the brochure, and we get a brochure that promotes both Midway and its partners and vendors. Highly recommended for museums that market special events. We work closely with the local and state film commissions, especially if the finished product clearly shows Midway as a museum. We're not a sound lot so if a production is simply looking for an aircraft carrier, we'll typically pass. But it also can be a nice source of income, if that's part of your business model. In many cities, an affordable source of advertising is the narrow, vertical street banners you see on street-side light poles. We produced banners that have a life expectancy of about five years, and then work with local entities responsible for approving installation. They typically are up for a few months at a time each year, and we store them in the interim. To make it low-cost, many municipalities allow small corporate logos, enabling you to get them to solicit sponsors. This may be a bit far afield for some, but periodically we have a need for some affordable giveaways at community events, event planners, students, etc. We recently found a manufacturer overseas that can produce ship's challenge coins, USS Midway pens, etc., on the order of 50 cents or less each, depending upon the quantity. For us, that's about 1/4 the price we had been paying out of a catalog for some items. Going direct takes a little time to get it set up, but can save a lot in the long run. We are always looking for photos of the museum to use in a variety of marketing contexts. A great source of free photography is Flickr (www.flickr.com) where Midway visitors post their photos for the world to see. There are more than 32,000 photos of Midway posted at Flickr and many times a photographer has gladly given us permission to use a particular photo. At no cost. We have found almost everything implemented at the last minute costs more than if it's thought out well in advance. Daily to-do lists can be a trap that keeps us from creating and taking advantage of marketing opportunities in a way that are cost-effective. So our approach aboard Midway is to meet twice a month and focus on three things: what's coming up in 30 days, what is sitting on the 60-day horizon, and what should we be considering or creating 6 months from now. This is easier said than done, but our experience clearly shows us we've been able to create less-expensive events, promotions, advertising, and other projects when we started earlier rather than later. I literally have "over the horizon" meetings posted on my calendar, twice a month. Understand our guests as much as possible and tailor our marketing to reflect that reality. Create partnerships with volunteers, community leaders, civic organizations and others who have a shared interest. Recognize that there are no quick fixes and that marketing is a marathon that requires a long-term commitment and discipline. Stay focused: don't try to be something we're not or make marketing promises our museum doesn't deliver. Share our passion but keep our eye building a strong museum and business. Marketing on a modest budget requires focus, attention to detail, and advance planning. While everyone would like to have additional resources, an organized approach coupled with creativity can produce significant returns on even a modest investment. 2. Is this your first visit to Midway? 3. If you have visited Midway before, please check the previous number of visits. 4. How long were you aboard Midway today? 5. Overall, how would you rate your visit to Midway? 6. Please rate the following aspects of your visit. 7. Please rate the following. 8. What did you like best about your Midway experience? 9. What did you like least about your Midway experience? 11. When did you decide to visit Midway? 12. If you live in the U.S., where are you from? 13. If you are an international visitor, what is your home country? 15. What is your military affiliation, if any? 16. What other area attractions have you or will you visit on this trip to San Diego? 17. Are there youngsters in your group today under the age of XXXXX? 18. What best describes your occupation? 19. What is the average level of education among the adults in your group aboard Midway today? 20. Please check the grouping in which your total family income falls. 21. What is the primary ethnicity of your group visiting Midway? That's the end of the survey. Please hand it to our guest services representative for your free Midway Magic bookmark or postcard. Thank you for participating!